There are many ways of migrating the On premise SQL Database to Azure SQL Database. 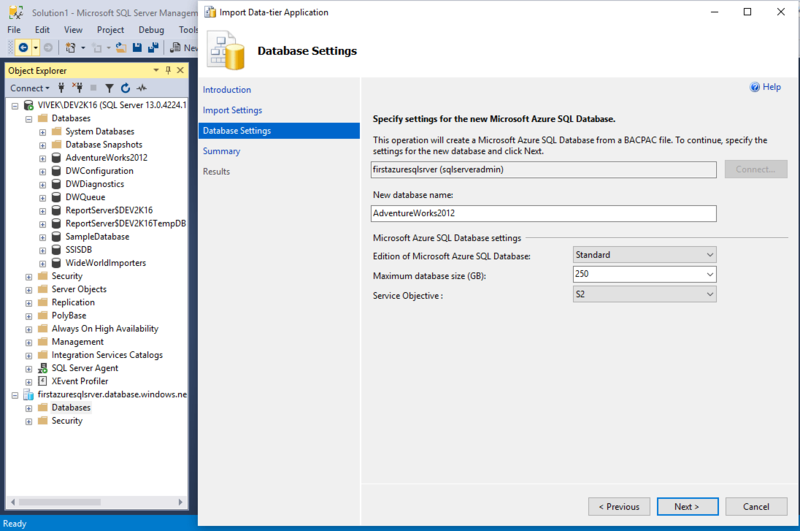 In the previous article on migrating SQL Database to Azure SQL Database, we discuss the SSMS deploy method as a step by step process. 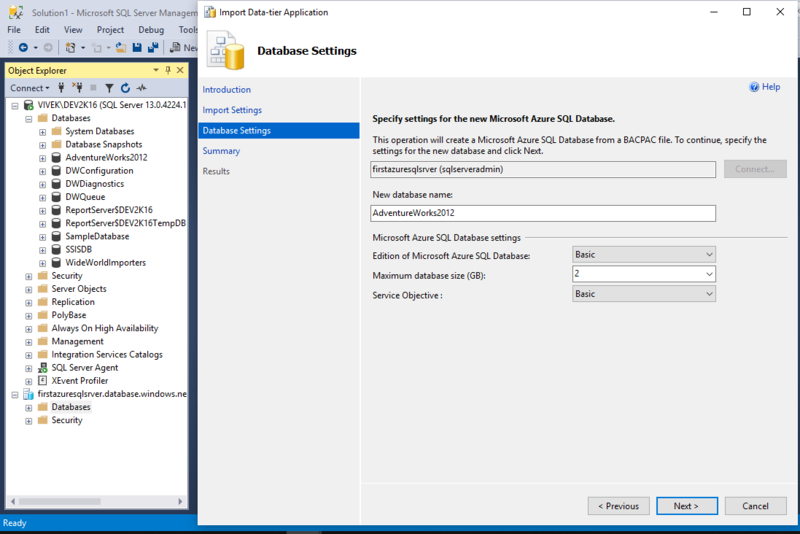 This article will tell how to migrate SQL Database to Azure SQL Database using SSMS Export/Import data as a step by step process. It is a multi steps process where in first step we need to export the data into a BACPAC (.bacpac ) and then in next step, import that BACPAC file. It means even if the import data step is failed, we doesn’t need to repeat the data export process again. As we have have the exported BACPAC file, we just need to restart the Import process. This process require longer downtime. So this process is suitable for larger databases if the downtime duration is acceptable. 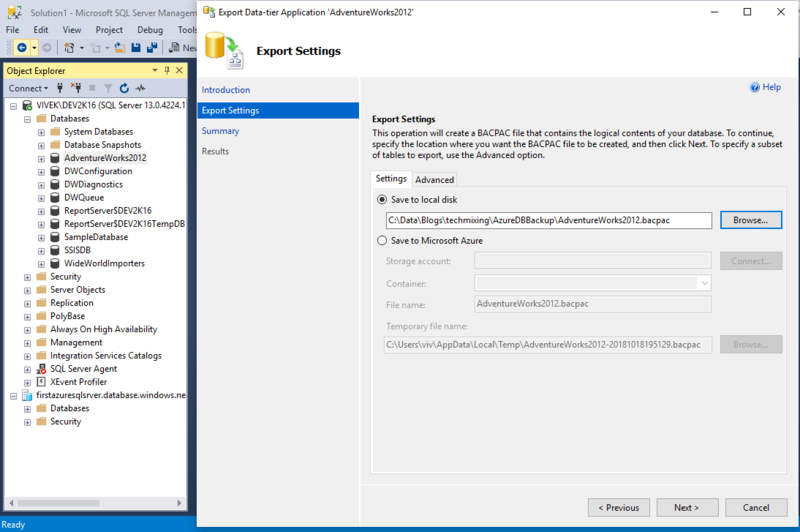 Once the option Export Data-tier Application.. clicked, it will open the Export Data-Tier Application page as shown in the below screenshot. Click on Next button to reach the Export Setting screen. In this screen, we need to select the location for storing the .bacpac file. Click on the Next button to reach the Summary Page. In this screen, we need to recheck the setting which we have specified. After verifying the specified settings, click on the Finish button. It will start the process of .bacpac file creation as shown below. Once this operation got completed, below screen comes. Click on the Close button. This will complete the database export part of this migration process. 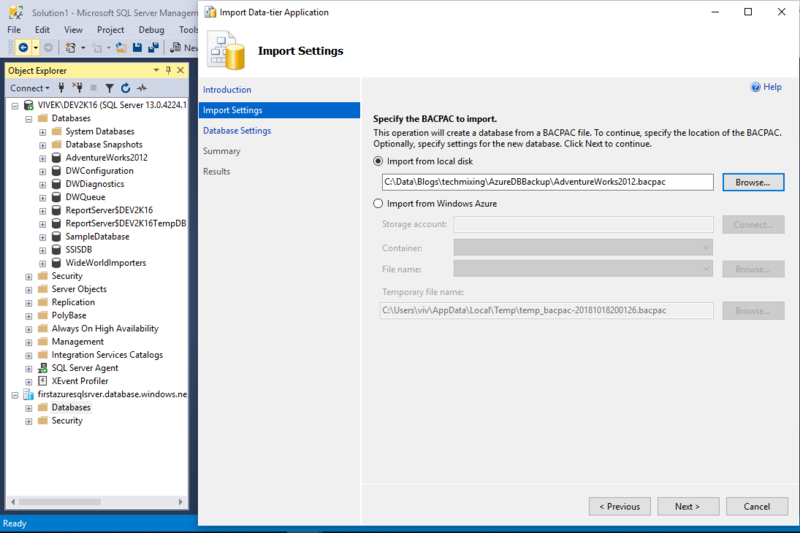 After creating the .bacpac file by exporting the data, we need to import it into the Azure SQL Database. 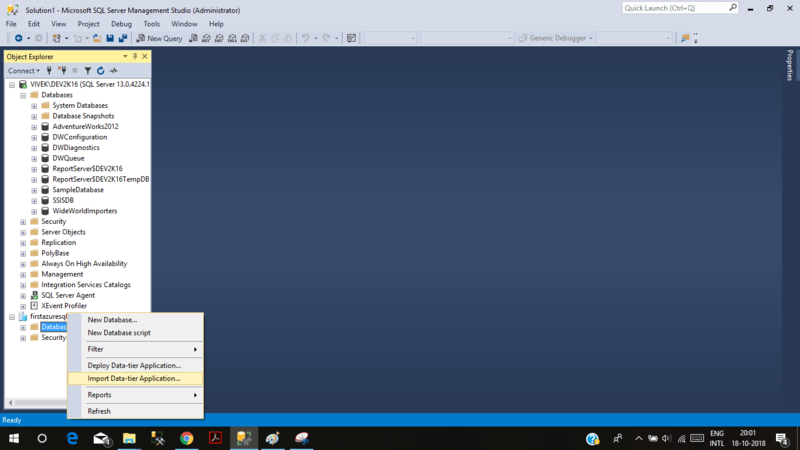 For this, first connect with the Azure SQL Server through SSMS. 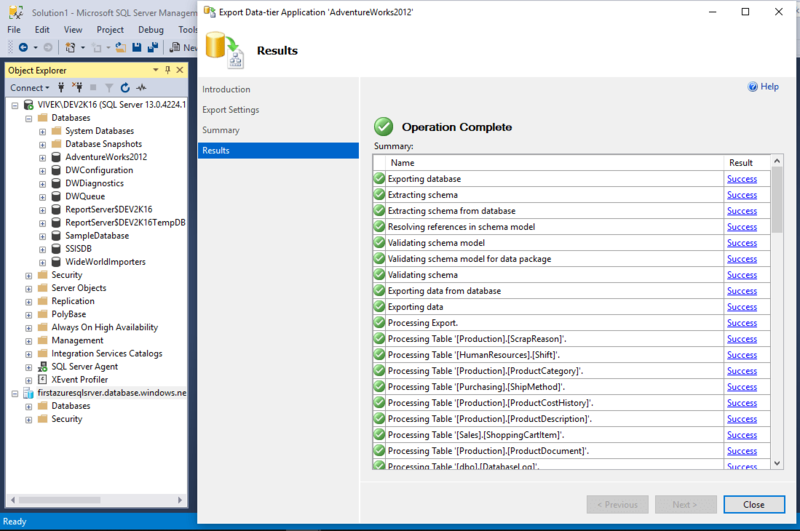 Then right-click on the Databases node and choose Import Data-Tier Application.. 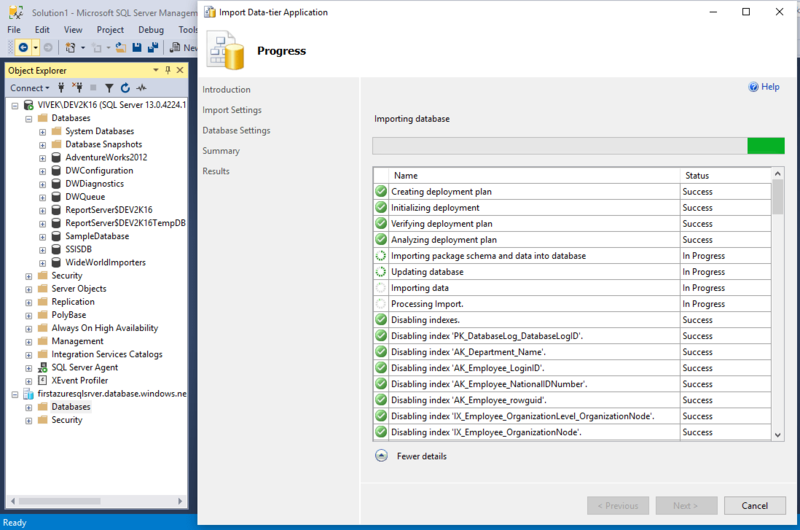 It will open the below Import Data-Tier Application.. page as shown below. Click Next button. It will open the Import Settings page. 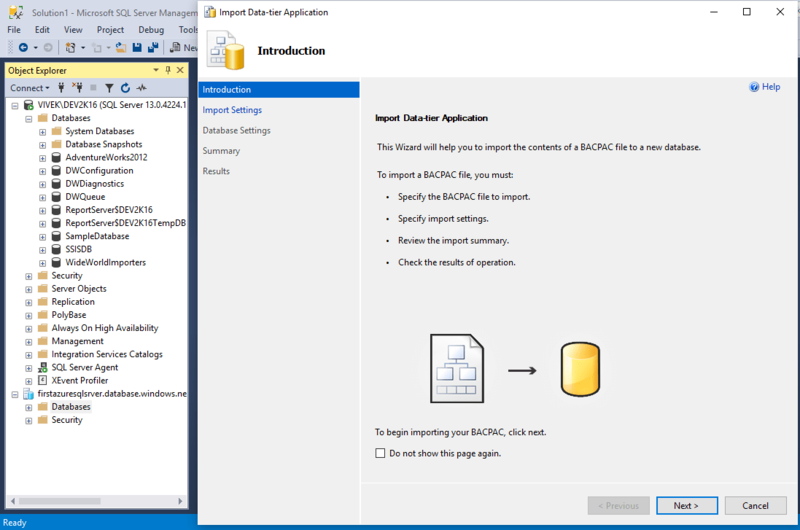 In this page we need to specify the .bacpac file location for import. We can change the default Microsoft Azure SQL Database settings as per your requirement. 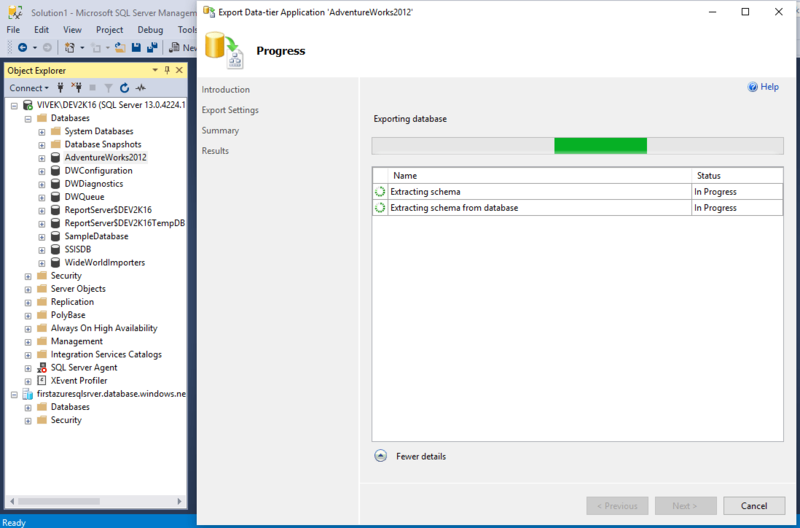 For example, I have changed the Edition of Microsoft Azure SQL Database, Maximum database size (GB) and Service Objective for my database as shown in the below screenshot. Once all database settings defined, click on the Next button. It will bring up the Summary page as shown below. Once settings verified, click on the Finish Button. It will start the Import process as shown in below screenshot. Once the Importing database process completed successfully, it will bring up the Result page. Click on the Close button. 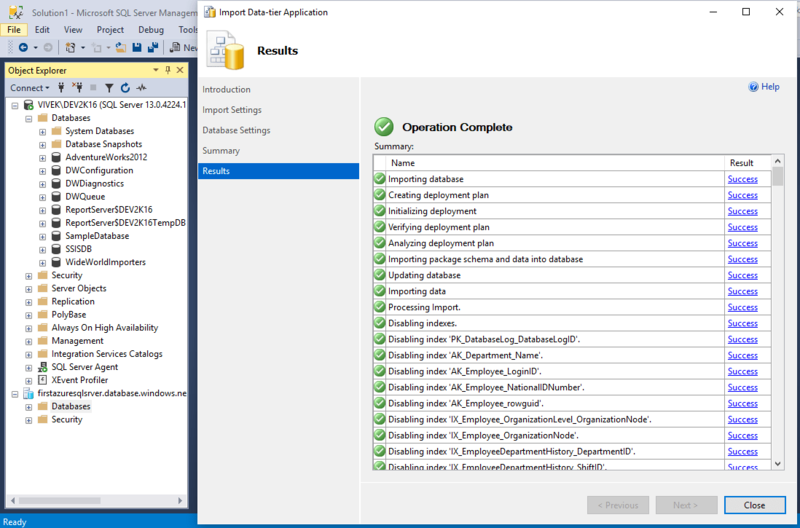 Database is successfully imported to the Azure SQL Database. We can it verify by connecting the Azure SQL Database using the SQL Server Management Studio and then expanding the Database node. 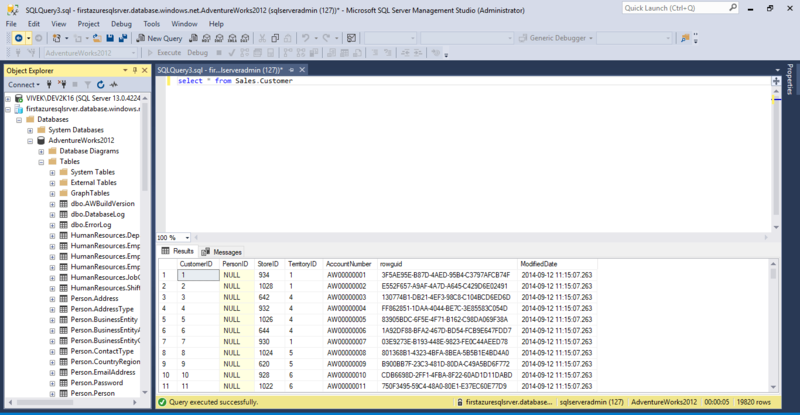 Database will be visible and it is available for SQL queries as shown in the below screenshot. 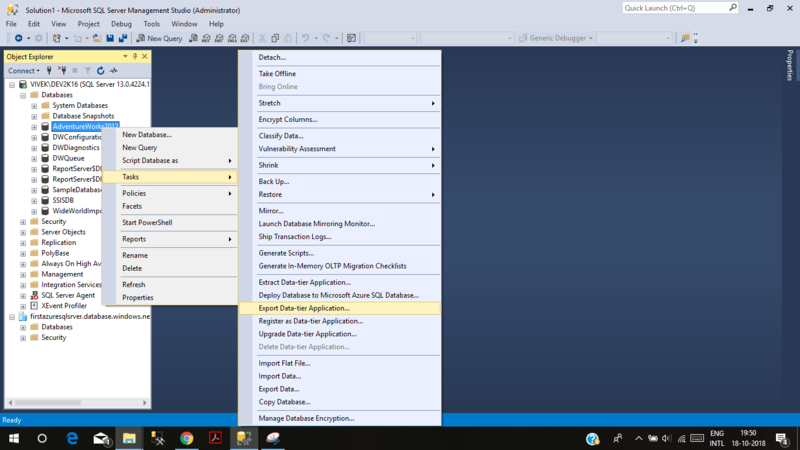 This article is the part of the series Migrating SQL databases to Azure SQL Database. 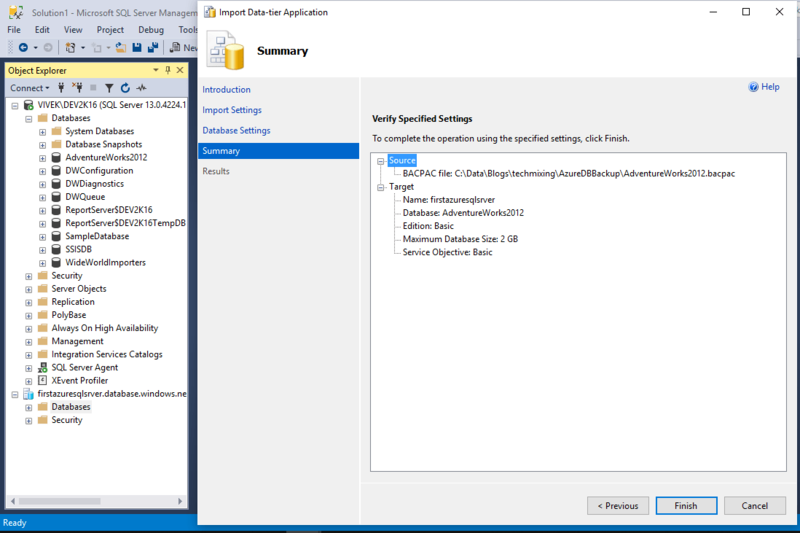 In the last article in this series, we discussed SSMS deploy method for migrating the SQL Database to Azure. 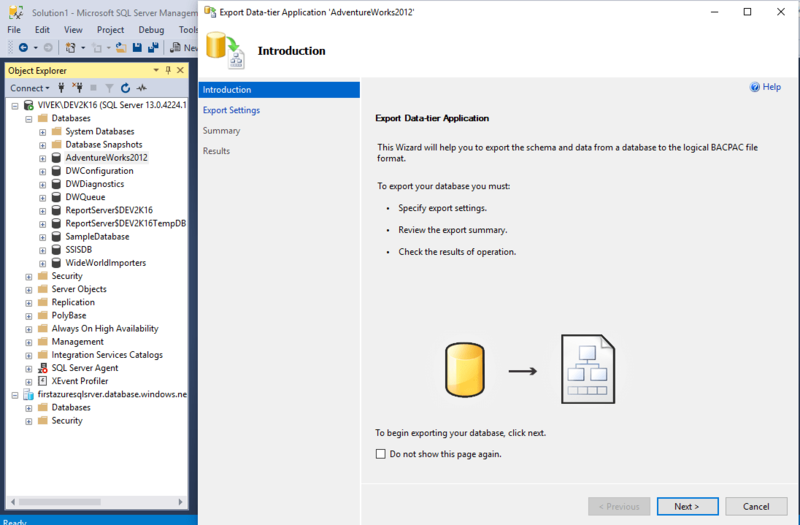 In this article we discussed how to migrate SQL Database to Azure SQL Database using SSMS Export/Import data as a step by step process. Unlike SSMS deploy method, which is a single step process and suitable for smaller database, it is a multi step process and suitable for large database but with longer downtime required. 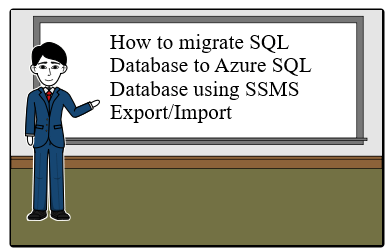 In the next article, we will going to discuss the migration of SQL database to Azure SQL Database using the Microsoft database migration assistant (DMA) tool.